The demise of Jang Song Thaek and those loyal to him just may be good news for the prospects of reforming the North Korean financial system. This system is perhaps the most perverse on the planet, having evolved in a context defined by North Korea’s isolation and inward orientation, its dogged adherence to the ideals of a State-directed economy, its inevitable need for mobilizing foreign exchange to meet unavoidable foreign expenses, its requirement for financing imports deemed essential for survival, and the international sanctions that have motivated Pyongyang to find all kinds of creative ways to get around the obstacles. Jang’s long history of operating at the epicenter of this system as an influential money manager for the Kim family and his apparent manipulation of the system for his own ends, suggests that his demise is likely to have repercussions on the future of the financial system itself. The North Korean system evolved over decades in a fragmented way. Banks, foreign exchange earning enterprises, and trading companies have served the Kim family, the Workers’ Party of Korea (WPK), the Korean People’s Army (KPA), and the Cabinet separately, with no overarching coherence or transparency. Initially, financial institutions including the Central Bank, Ministry of Finance, and the Foreign Trade Bank, were based on the Soviet model for a State-planned economy with money playing a very limited role in the national economy mainly as an accounting device. Aid and counter-trade with the Soviet bloc lowered the need for external finance. Debt default after a binge of foreign borrowings in the 1970s led to the establishment of new banks able to reestablish creditworthiness by not having to carry the debt default burden carried by the Foreign Trade Bank. North Korea needed foreign exchange to purchase luxury goods and critical imports for defense industries and production enterprises. Especially after the collapse of the Soviet Union, this led to the alignment of foreign exchange earning enterprises and this proliferation of small banks with the core interests of the “court” economy, military economy, and People’s economy. In addition to providing trade finance and servicing the needs of enterprises doing business abroad, these banks engaged in foreign exchange speculation, further adding to their appeal. 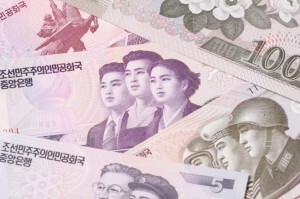 Each part of the fragmented North Korean economic system wanted some of the action in order to raise foreign exchange and have control over specific banks to advance its own interests. The lack of transparency and control over North Korea’s financial affairs was the price the leadership was willing to pay to enable this system. As a result, North Korea has no national financial statistics, no significant banking supervision, and no capacity for macroeconomic management of an increasingly mixed economy. Despite some attempts at innovation, such as introduction of debit cards, North Korea has made no meaningful progress in building a modern financial system capable of meeting the needs of households and enterprises participating in market activities. The weaknesses of the financial system inhibit North Korea’s ability to interact normally with the rest of the world, sanctions notwithstanding. Allowing KPA ownership of significant foreign exchange earning enterprises and affiliated banks was one way that Kim Jong Il maintained the support of the military during his tenure, when he faced internal challenges linked to the famine of the 1990s and problems on the international front. The Cabinet, responsible for overseeing the People’s economy, was left with the dregs as major foreign exchange earning capabilities were co-opted by the dominant needs of the leadership and military. Jang played a central role in overseeing the various ways the inner circle of the leadership or “court” economy managed the foreign exchange resources that were vital to maintaining power and providing the patronage needed to bolster loyalty among the Pyongyang elite. While there were episodes when Jang overreached and fell out of favor, his competencies as a money manager, overseas connections, and marriage to Kim Jong Il’s sister eventually led to his rehabilitation. The most visible was his purge in 2004 during the heyday of North Korean economic reform efforts, and rehabilitation in 2006 in the period of disillusionment with these efforts. In the later years of Kim Jong Il’s tenure, Jang became increasingly active in developing stronger economic ties with China and promoting investments in North Korea. He was also at the center of an initiative to establish the Taepung International Investment Group and a State Development Bank for North Korea. However, neither gained traction as they competed with the cabinet in seeking to set up new institutions to strengthen central control over the attraction and management of foreign capital. Some analysts have mistakenly viewed Jang as a promoter of Chinese-style economic development and as an economic reformer. In fact, he was a protagonist of maintaining centralized control over foreign exchange inflows and of the political economy of the patronage system. He did not nurture the growth of markets and the political economy of wealth accumulation by traders and entrepreneurs independently of that control. As we all know, after the death of Kim Jong Il, Jang was rewarded with several appointments to powerful positions and became widely regarded as a steward of the family’s core interests as well as a defacto regent for Kim Jong Un. Given the history of divided control over money-making activities, this was a classic example of putting the fox in the hen house. Aside from using his new authority to cross traditional boundaries and grab control over valuable foreign exchange earning enterprises with ties to the KPA, Jang also appears to have undermined changes in economic policy. Initial pronouncements that the cabinet would be given more authority to devise and implement a new national development strategy led to heightened expectations of a more reform-oriented focus under Kim Jong Un. However, Jang’s reluctance to empower the cabinet as well as his desire to retain control over significant foreign exchange earning enterprises and foreign investment is likely to have had a dampening impact on the pursuit of more aggressive systemic reforms by the cabinet. Moreover, Jang’s ambitions to gain more control also moved into dangerous areas. Monies not being redirected to the cabinet for allocation under a broad economic development plan or sequestered for the personal use of Kim Jong Un, seem to have been placed in accounts directly under the control of Jang and his loyal supporters. His over-reach for power seems to have gotten the better of him this time around. With Jang’s demise there is now a potential opportunity to make fundamental changes in the North Korean economic management and financial systems. Removing his influence over major foreign exchange earning enterprises operating outside any institutionalized supervision means that some other mechanisms must be put in place to manage these important national resources. Whether this will lead to a more rational system of cabinet-managed financial institutions serving an economic development strategy endorsed by Kim Jong Un is a basic question. Early indications are that the cabinet will be empowered to exercise more centralized control over the economy, but how far this will extend into the fragmented financial system remains to be seen. One indicator of possible significant change is whether the KPA will regain its former economic independence or become more closely integrated with national economic and financial management. This is important for improving efficiency in allocation of resources for economic development and having more control in balancing security expenditures with investments in the general economy. Another indicator will be whether the existing system that provides funds for sustaining luxury goods patronage for the Pyongyang elite and for showcase projects like equipping the new Masik Pass ski resort, will be handed over to new more loyal technocrats to manage. Or will the Cabinet be given more latitude to shape the future political economy and distribution of wealth, given the reality that access to market power is becoming more valuable for the Pyongyang elite than receiving patronage? This would be a major change that could lead to new incentives for more rational economic management. Acknowledgment that markets are here to stay would open the possibility of addressing the need to build new financial institutional capabilities required for mobilizing and regulating private savings and economic activity. This would also help focus attention on ways to improve macroeconomic management of the mixed state-directed and market economy system. Kim Jong Un has made repeated public promises to focus on economic development and improve the livelihoods of ordinary North Koreans. Another major question is whether this will lead to an expanded and more secure mandate for the cabinet to put in place policies and financial management practices that would be more in line with international practice and expectation. North Korea remains on the black list of the inter-governmental Financial Action Task Force and has no relations with the core institutions of the global financial system, especially the International Monetary Fund. These limitations, even more than sanctions, affect North Korea’s ability to participate in the international economy in a responsible way. Moreover, North Korea’s drive to open new Special Economic Zones to attract foreign investment, which has continued since Jang’s demise, seems at odds with the theme of pursuing a self-sufficient economy struck in Kim Jong Un’s 2014 New Year’s Address. Despite North Korea’s rhetorical attachment to the idea of a self-supporting economy, a successful economic development strategy must be grounded in reality, namely the growing role of markets and greater outward orientation for the economy. This will require openness to foreign advice and help as well as a willingness to move the system towards transparency and rules-based foundations that underpin financial systems in the rest of the world. There is now an improved possibility that younger and progressive technocrats in North Korea will be given permission to develop its financial policies and institutions. This is an essential step to underpin serious efforts to mobilize and allocate more efficiently domestic savings for investment and economic growth. In today’s North Korea, accumulation of savings is increasingly in private hands and in enterprises active in both the state-directed and market economies. The financial system needs to evolve in response to this reality if private savings are to be effectively mobilized for economic development. New financial policies and mechanisms are also required to handle in-flow of foreign investment and development assistance as well as expanding trade. Foreign capital together with the benefits of trade will be needed to supplement domestic resources for North Korea to achieve a sustained high rate of economic growth. This needs to be a central consideration in North Korea’s policies on its external relations. Thus the door has been opened for important new directions in the way North Korea manages its ways of obtaining external finance and how it applies its scarce foreign exchange among the competing needs and interests inside the country. Whether the financial system becomes less opaque and cabinet officials more willing to engage with international experts on how to meet the country’s economic and financial challenges will be important indicators of the future course of economic policy under Kim Jong Un. The June 7, 2013 Report of the Panel of Experts to the Security Council pursuant to resolution 1874 (S/2013/337) lists 30 banks currently believed to be operating in North Korea along with notes on what is known about their affiliations. “The Cabinet will function as a control tower of the economy,” from an interview with Chosun Sinbo by Kim Jong-ha, Chief Secretary of the Cabinet, reported in Korea Herald, December 29, 2013. It is noteworthy that the New Year’s Address did not mention the Special Economic Zone initiative.